What problems do Facial Fillers address? I wish there was something simple for those little lines around my mouth. Many of us notice fine lines developing on the face in our thirties. These can often be the result of muscular activity or sagging. The lines that form on your face are areas where the body's own collagen has thinned and broken leaving a depressed line. 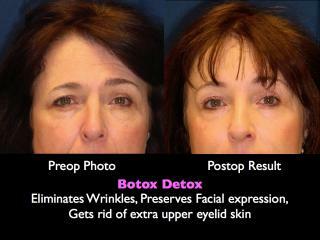 The wrinkles around the eye can often be due to muscle activity and may be improved with Botox. If the lines are very deep or are due to skin sagging - such as the lines that run from the nose to the corners of the mouth (nasolabial folds) - then a filler often softens, or sometimes even eliminates, the line. It is important to also note that while facial fillers are great for temporarily enhancing beauty, they will not give you the same results as surgical treatments. How are facial fillers injected? The chosen filler is injected into the skin itself to plump up the depressed line in the skin. When the lips are injected, we place the filler on the inside of the lip to turn it out a little. The face is a sensitive area, so the area to be treated is first numbed with ice or an anesthetic creme, making the injections tolerable. All facial filler injections are performed by me, a board certified plastic surgeon. Juvederm is a smooth consistency gel made of hyaluronic acid and is manufactured by Allergan. Restylane has all but been replaced by Juvederm because it lasts longer. I typically use a Juvederm injectable to restore volume and smooth away wrinkles in the face. It lasts approximately 6-9 months. It is used for lip augmentation as well as naso-labials folds, marionette lines, glabella lines, and tear trough and scars. Juvederm costs $550 per syringe, so it is important to keep in mind that most patients need more than one syringe to achieve the desired results. Sculptra also has the consistency of gel and may last several years. This injectable is done in a layering method with a series of injections, usually done at two to four week intervals, until the desired volume is achieved. Sculptra may also be used in the nasolabial folds, marionette lines, jowl contouring, cheeks, glabella lines, tear trough and scars. Sculptra is not used for lip augmentation. Sculptra costs $700 per vial, each vial contains 6 cc. Most patients elect to have the entire amount of a vial injected in one session. However, you may have the 6cc injections spread out over 2 sessions, if it is done within 30 days. For the best possible result, Sculptra should me mixed 3 days prior to your treatment. Therefore, a $150 deposit is required for the appointment, as the bottle is opened and mixed for you in advance of your visit. Radiesse is used to fill and help restore soft tissue facial contours. Once injected, Radiesse immediately adds fullness to your face giving you a visible result at the first treatment session. While treatment effects will differ for each person, in a clinical study, the treatment lasted for at least one year for all patients. Radiesse may be used in the nasolabial folds, marionette lines, jowl contouring, cheeks, glabellar lines, tear trough and scars. Radiesse costs $800 per syringe and again, patients often need more than one syringe for the initial desired result. What about Injections using my own Fat? While it is totally possible to use your own fat as a facial filler, it is worth pointing out that doing so is a more involved process than using the facial fillers noted on this page. However, since fat injections are derived from your own fat tissue, they are the most natural way to restore youthfulness to your face. Using your own fat involves liposuction and fat grafting techniques, so most patients opt to have IV sedation for the procedure. The fat is removed from your abdomen area, correctly processed and purified, and then placed in syringes for injection into the facial areas needing volume. The fat extracted must be purified and injected very carefully at different levels beneath your skin in order to produce good results. The fat that survives the injection process is there permanently and since it is your own tissue, there is no chance of an allergic reaction. To learn more about facial fat injections, please see our fat transfer procedure info page and this blog post about facial rejuvenation using fat injections. We ask patients to follow some basic recommendations prior to having their facial filler injections. Recommendations typically include avoiding blood thinning medications (aspirin and Ibuprofen, for example) at least two weeks prior to their appointment to help reduce the risk of bruising. We also ensure patients undergoing injectables are not pregnant or nursing, actively using Accutane or Retin A. What is Facial Fillers Post-Op recovery like? You may return to work the next day with Botox, Restylane or Sculptra, however a small percentage of patients experience some bruising for a few days following the injections. When you're price-shopping dermal fillers, be sure to find out who will actually be performing the injections. If it's not a board certified plastic surgeon, keep looking. You deserve the best! Save when you are a member of Brilliant Distinctions with Allergan! Brilliant Distinctions is an exclusive rewards program that helps you save on select Allergan products and services. It's easy and it adds up fast! If you are not yet a member, we'll be happy to help you register when you come into our office. Earn points to get cash vouchers each time you get Botox and/or Juvederm XC, as well as Latisse! See our gallery of facial filler photos, to see what kinds of results you can expect from injectibles. We are conveniently located in Baltimore, only 30 miles from BWI airport and only 20 minutes from the downtown Amtrak train station. Parking is always easy and your dermal filler injections will be performed by me, a Yale-trained, board certified plastic surgeon with over 20 years of experience.